Buy all products at a reduced price! Environmentally friendly and fluorinecarbon free, nanoglider to temperatures from +10 to -3 degrees C. Suitable for all types of snow. Highly water and dirt repellent! Easy application. Apply with the sponge on the bottle. Ready for use just after a few minutes. The glider is very effective and stays on mile after mile. Clean first the ski base with ScanGlide Wax Remover. This conditions the base and opens the pores of the skibase allowing ScanGlide NanoGlider MT enter deep into the sole. A bottle of ScanGlide NanoGlider MT 30 ml. consumption to approximately 20-30 applications, so it is very durable in use. Environmentally friendly and fluorinecarbon free, nanoglider to temperatures from -10 to -25 degrees C. Suitable for all types of snow. Highly water and dirt repellent! Easy application. Apply with the sponge on the bottle. Ready for use just after a few minutes. The glider is very effective and stays on mile after mile. Clean first the ski base with ScanGlide Wax Remover. This conditions the base and opens the pores of the skibase allowing ScanGlide NanoGlider XCT enter deep into the sole. A bottle of ScanGlide NanoGlider XCT 30 ml. consumption to approximately 20-30 applications, so it is very durable in use. Fluid-free topping to all types of gliders, helping to increase gliding properties. Apply with the sponge to the bottle. After 5 minutes, polish it over with a fibercloth. The topping are very efficient and durable. Effective and gentle allround base cleaner for all types of skibases. Dissolves and removes all types of old fluoride glider, fluorinatedpowder, topping and waxes. ScanGlide Wax Remover is manufactured by the latest technology and is designed to remove fluoride products without damaging paraffin base in the sole. ScanGlide Wax Remover can use over the ski base as it also clarifies the sole for new glider. 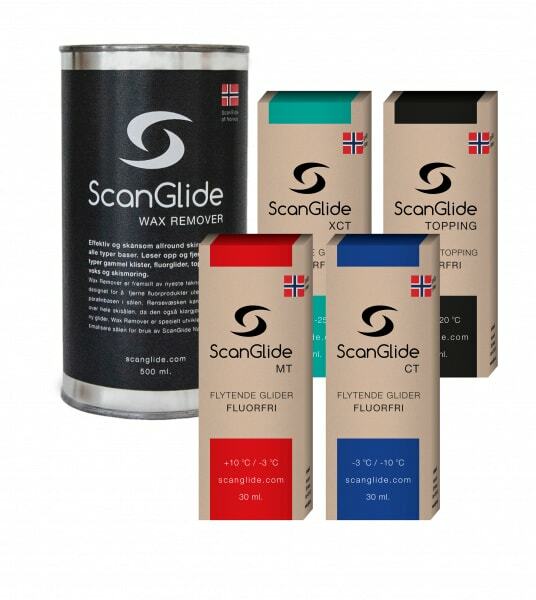 ScanGlide Wax Remover is specifically designed to optimize the sole before using ScanGlide NanoGlider’s. Apply a thin layer of wax remover onto the base with a lint-free cloth / fiberlen. Wipe the ski base clean with lint-free cloth / fiberlen, use scratching if necessary. Then wipe over the ski base again with lint-free cloth / fiberlen in longitudinal direction so it is completely clean for old dirt and are dust free.